Our charter clients and customers are all unique, fun, and much more! Invert Sports can accommodate any size of group! "It's been said that the two happiest days in a boat owners life are the day they buy a boat and the day they sell that boat. If you love boating but don't have time for the part time job that goes along with owning and taking care of a boat, Invert Sports is your solution. 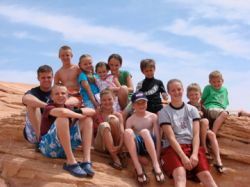 We've gone with them to Utah Lake countless times, and this year will be the third year in a row that we'll hire them to take us to Lake Powell. We've referred many friends and family to them and have always gotten rave reviews. Go boating one time with Invert Sports, and you'll never consider owning a boat again!" "What a fantastic time our entire family had last Saturday on Utah Lake! Each and every member of our family had a super fun time and the four hour time block was just perfect. Even our trepidatous, first time parents, were quickly at ease having little six-month-old Ellie on board the entire time. Eric and Leasal were a lot of fun, and Eric was a patient and skillful teacher. This activity was definitely the highlight of our family trip, and we thank you again for offering such a fun opportunity." "I just wanted say thank you for everything. My wife and I had a great time, and your team was extremely professional throughout our whole experience. I will definitely be using your company again for my trips to Vegas, and will refer you any business that I can. I hope to see you again, as soon as our sunburns heal."